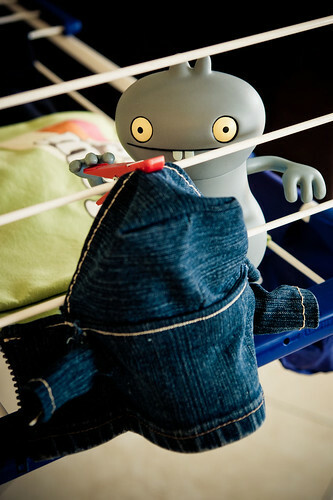 Uglyworld #1126 - Washings Day (Project BIG - Image 156-365), a photo by www.bazpics.com on Flickr. This mornings we was uppers mega earlies to takes Scottish Mama to the hairyport for her flighter backs to Scotland, where she has already arrivered. As soons as we gots back from the hairyport Baz and Mireille started sortings out all of their washings needing done, so I askered if I could haves my denims jacketer washered too as it was gettings a littles bit stinkies with alls of the travels and adventures I has makered in it. Once the washing machiner was finished removings the stinkies and makings my jacketer smells awesome I grabbered a peggy from the peggy bag and hangered it outs on the clothings drier we has. Hopefullies it will be driered outs in time for me headings off to works in Marburg with Baz again tomorrows morning!